Members of the FM Diversion Authority, U.S. Army of Corps of Engineers (Corps), and other leaders from around the region attended the Red River Basin Commission Conference in Fargo this week. Col. Samuel Caulkins, the District Commander of the St. Paul District of the Corps, and City of Fargo engineer April Walker presented on Wednesday, Jan. 18, about the the numerous alternatives considered during the development of the FM Area Diversion Project. Following their presentation, the Minnesota Department of Natural Resources Commissioner Tom Landwher presented its viewpoints about the project. Read more about the presentations. 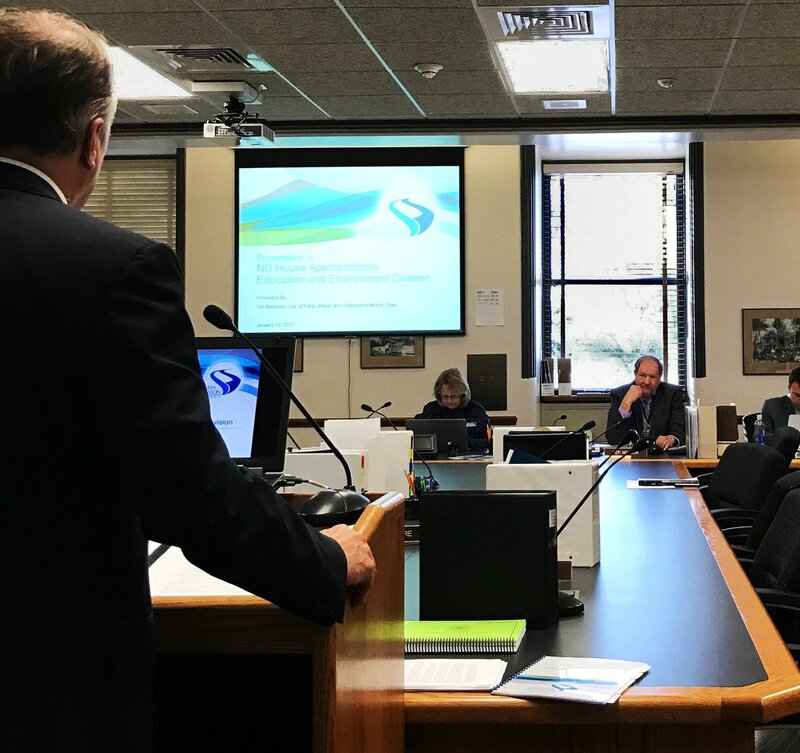 Leaders from Fargo and Cass County traveled to Bismarck earlier this month to update state lawmakers on the progress of the FM Area Diversoin Project.In total, the state of North Dakota has pledged $570 Million to build the Project. ND Legislative session continues through April. FAQ: How was the location for the Project Chosen? The Corps recommended a North Dakota Diversion after looking at numerous alternatives in both MN and ND. The Corps is required to determine a National Economic Development (NED) plan. The NED outlines the greatest net national economic benefit consistent with protecting the Nation’s environment. The NED plan was a 40,000 cubic feet per second (cfs) diversion channel on the Minnesota side. The Corps has the ability to recommend a different plan for construction, which was done. The Corps recommended the Locally Preferred Plan, which was a 35,000 cfs diversion channel on the North Dakota side. There was considerable opposition to a diversion on the Minnesota side from state leaders, including Dilworth Mayor Chad Olson and Rep. Collin Peterson, who said the plan had a “minus 5 percent” chance of being approved. The North Dakota diversion has the added benefit of also protecting flooding along six rivers (Red, Wild Rice, Sheyenne, Maple, Rush, Lower Rush). This plan also benefits more people and infrastructure than the Minnesota diversion (the benefits to Fargo were similar with both plans). At the time of development, the Minnesota Diversion would have had downstream impacts all the way to the Canadian border. This plan likely would have developed similarly to the North Dakota Diversion, requiring an upstream staging area.